I am a professionally trained art therapist. Where my focus is on providing a safe space free from judgement and critique. Rather my goal is to create a space that allows for trust building, self reflection, insights and allowing individual(s) to give voice through the creating of art. Here is a little autobiography to who I am, what I have studied and how I became so interested in the art therapy profession. In my adolescence I was in and out of hospitals for an undiagnosed pain disorder. This experience lead to a lot of trauma associated with the medical system. However it lead me to the art therapy profession. This started the journey doing my undergrad degree at the University of Guelph in studio art and psychology. The power of art has always had a special place in my heart and been a way of self care. So when I became introduced to art therapy it was something I was instantly attracted to. By having the opportunity to have time to create art in a safe place where you are not judged or dismissed, allowed for safety to be established. This left me with a passion for art therapy and the value it has. This lead me to looking into art therapy programs. When I applied to Kutenai Art Therapy Institute (KATI) I was pregnant, and started my training as an art therapist when my little one (Lennon) was only two months old. She has been a crucial part in my growth as an art therapist these past two years. She is always teaching me new ways at looking at life and the world. Through my personal experience and my further learning at KATI, I came to value the person-centred humanistic worldview and the importance of mind-body integration in the healing process. This worldview I feel provides a touchstone for art therapy participants. I feel it is important to bring together the mind, body, and soul/spirit to realize healing for the whole person. My internship was primarily at North York General Hospital working with both inpatient and outpatient Mental Health (adolescents, adults and seniors), Adult Eating Disorder, One on One through the Spiritual Cares office and Workshops for Staff and Volunteers. However I also have experience with children in grades 4-6 who recently immigrated to Canada, along with I volunteered at a long-term care facility in Brampton, ON. Art is a form of communication, that allows for express to what does not always have words. Art should be something that a person enjoys doing and allows people to express themselves, it does not always have to be beautiful. You don’t have to be good at it. Art allows you to reveal your inner–emotions to be expressed in a way that words can not always convay. 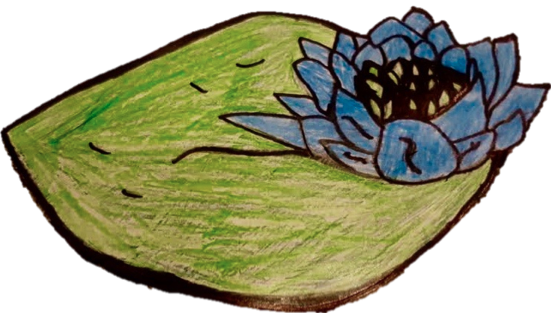 So why the name Blue Lotus, the symbolism was perfect for starting my business up in the Beaches. Though the flower does not grow here, lotuses have long been recognized as sacred by many of the world’s religions, in particular India and Egypt, where it is a symbol of the Universe itself. Of all the flowers it grows from the murky water, still bright and beautiful. To me that represents pure resilience. Along with representing rebirth, beauty, wisdom, transformation, relaxation and harmony. As it is symbolic that life has its challenges, you can grow, learn and reflect from all life experiences. This allows for an inner strength to be developed within yourself. Creativity Matters, Healing, Transformation and Growth can Occur!